Posted on 04. Nov, 2010 by Corey in All, Dayton Dragons Baseball, General Baseball. I am very fortunate that to have some great friends. Our close group has been together for years, dating back from when we were kids, attending some of the same summer camps, and then high school. There has been some distance in the group starting with college, but we have stayed in great contact and have seen each other quite frequently. Sure, we have lost a couple of good soldiers along the way, but the core of Dan, Lenny, Mark and myself has been together through thick and thin. 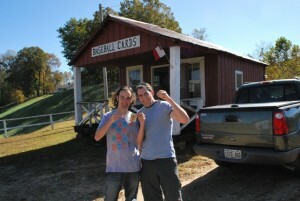 For the past couple of years we have tried to pick a weekend in the fall and get together for a few fun packed days. Our journey this year took us to the Blue Ridge Mountains, in Northern Georgia for some hiking and bonding time. I do not want to bore you with personal details of our weekend, but feel it necessary to share one story that happened. The first day that we were there, we decided to take a short hike at the base of the Appalachian Trail, to get loose and excited for our day long walk the following morning. The drive from our cabin in Blairsville to the trail head consisted of many windy state roads. The deeper we got into the mountains, the less populated things appeared to be. As the GPS said we were minutes away from the start of our hike, I stared out the window into the woods and pastures looking for animals or other creatures walking around. It was then a small red barn appeared out the car window the right, seeming like it was dropped in from the sky in the middle of nowhere. 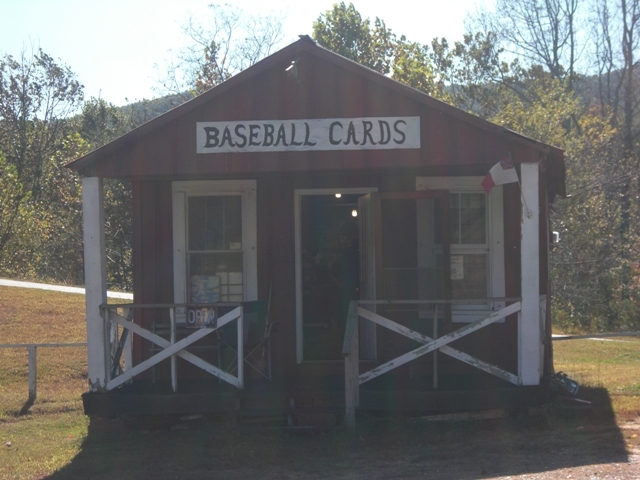 As we got closer to the barn, the sign at street level said “Owltown Baseball Cards.” A feeling came over all of us in the car that we had to stop and check this place out. 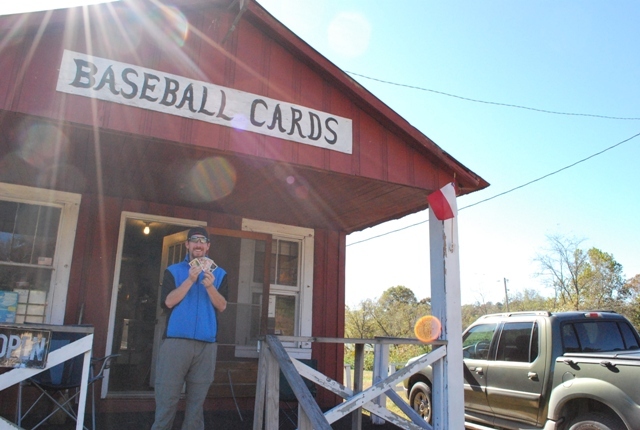 Lenny slammed on the brakes and very carefully turned around so we could visit the card shop. 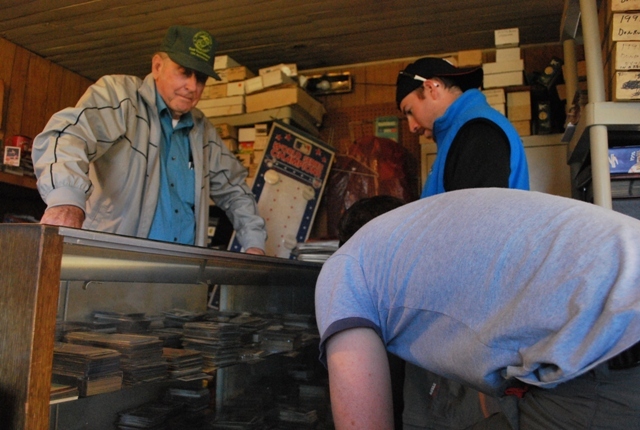 Not sure what to expect, we walked into the small barn and was greeted by the store owner, Bob. Bob appeared to be an older age gentleman, guessing in his late 70’s. 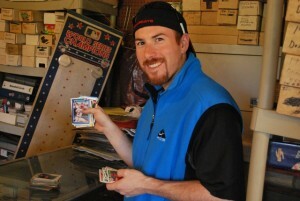 He was sitting on the couch sorting baseball cards into stacks by player. As we glanced around the shop, it appeared this was how he liked to display his merchandise, in stacks by certain players. 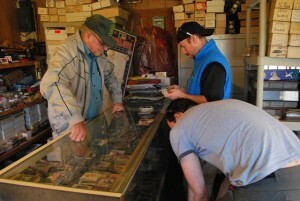 It became immediately apparent that he had very few cards from this decade, but Bob had quite a collection. My friends and I started small talk with Bob and found out he played minor league baseball many years ago in Peoria, Illinois for the Chicago Cubs and also in the Angels system. 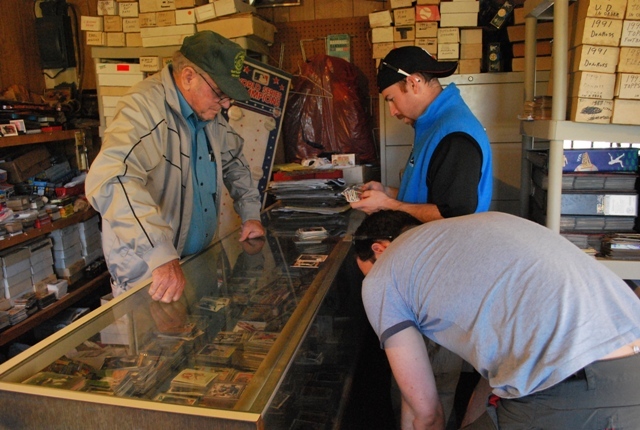 Having the feeling that this card shop dropped out of the sky for us to find, we knew that we had to buy something to support Bob and his business or hobby. As I looked around the shop for something interesting I noticed the large number of Cincinnati Reds cards, with stacks ranging from Johnny Bench and Pete Rose to Eric Davis and Barry Larkin. 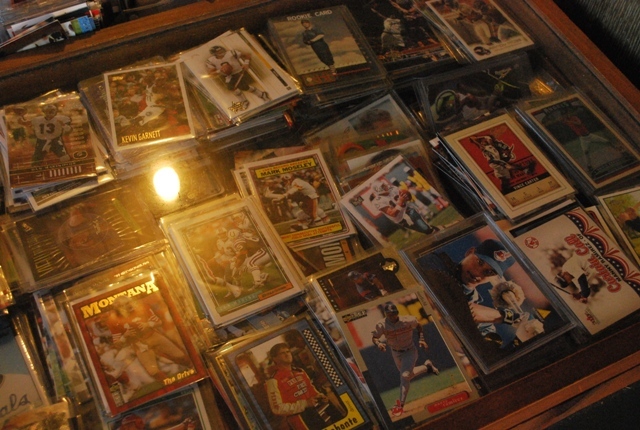 As my eyes continued to wonder around the glass case, one stack of cards lit up like a light bulb. 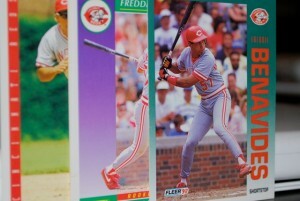 An entire stack of Freddie Benavides Cincinnati Reds cards appeared before my eyes. I knew right then I had found what I would be purchasing. I asked Bob to hand me the stack of Benavides cards and I began to shuffle through them, picking out a few as I went along. Bob began to tell me how much he enjoyed watching Benavides play as he sat back down on the couch. I was amazed at the knowledge of the game he had remembering so many players from the past few decades. For the past three seasons I have had a chance to work with Benavides as he has been the Field Coordinator for the Cincinnati Reds. 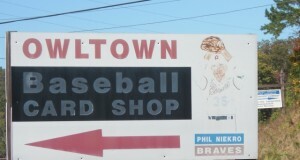 I respected him as a coach and also remembering him playing for the Reds and Expos. 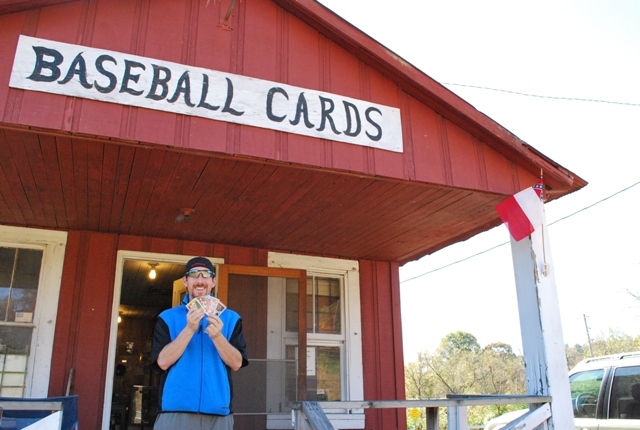 And the fact that Bob had an entire stack of card dedicated to him made it that much cooler. My others friends picked out a few cards of some players they enjoyed and we paid Bob for our products. 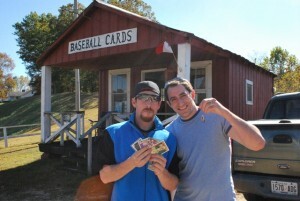 We posed for a few pictures, and continued down the state route to begin our hike. None of us could get over how random it was to find the Owltown Baseball Card Shop on the side of the highway. We all joked that when we returned down the road later that night, the shop would probably be gone, which of course it wasn’t. 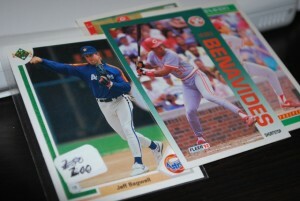 Besides the pictures as memories, I now have a few Freddie Benavides cards to display on my desk. It always taught me to always have my eyes open, you never know what random things you will find on the country roads.